Mobility Romford is a supplier of high quality mobility products with more than 10 years experience in the industry. We supply a vast choice of mobility products with the purpose of offering a comprehensive choice of mobility solutions for a range of applications and needs. 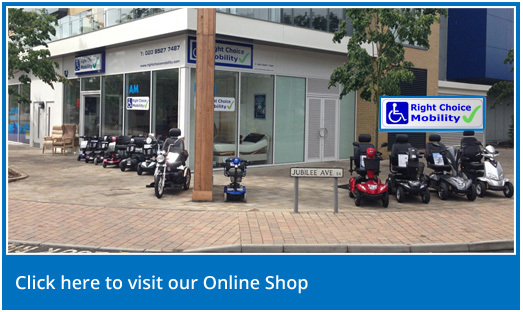 At Mobility Romford, we supply mobility scooters, rise and recline chairs, bathing aids and numerous accessories. We’ve got a well-stocked showroom so you can come and test our products prior to purchase, or we are able to provide home demonstrations at your convenience. For additional information, it is possible to download our brochure by clicking here. We pride ourselves on delivering great advice and help to make sure that you will be 100% satisfied with your purchase. Mobility Romford does not use a tough sell mentality, as our aim is always to ensure that you get the best product for your needs. We highly recommend you test our products at our showroom or book a home demonstration, and for some mobility products we provide an assessment. Our team will be with you every step of the way from enquiry to purchase. For more details, visit our main website – www.rightchoicemobility.com.